Energy density is the number of calories (energy) in a given amount (volume) of food. By choosing foods that are low in calories, but high in volume, you can eat more and feel fuller on fewer calories. Fruits and vegetables are good choices because they tend to be low in energy density and high in volume. So what about raisins? They're actually high in energy density — they pack a lot of calories into a small package. 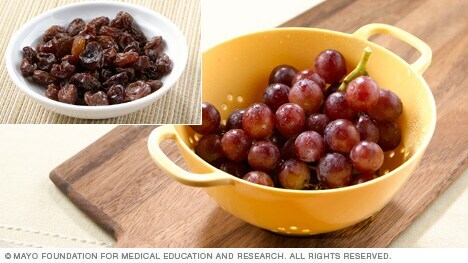 For example, 1/4 cup of raisins has about 100 calories. For about the same number of calories you could have 1 cup of grapes — and get more bite for your calorie buck. USDA National Nutrient Database for Standard Reference, Legacy Release. U.S. Department of Agriculture, Agricultural Research Service. https://ndb.nal.usda.gov. Accessed April 2, 2019. Start simple with MyPlate. U.S. Department of Agriculture. https://www.choosemyplate.gov/start-simple-myplate. Accessed April 2, 2019. Hensrud DD, et al. Add 5 habits. In: The Mayo Clinic Diet. 2nd ed. Rochester, Minn.: Mayo Foundation for Medical Education and Research; 2017.